The Samsung Galaxy Amp Prime 3 is a device with a 5-inch HD display. The phone is powered by a 1.4GHz Quad-Core processor with 16GB of internal storage and up to 256GB microSD card memory expansion. The device has an 8-megapixel rear-facing sensor with Full HD video recording. In front, there is a 5-megapixel camera for selfies and video calls. It includes a 2600mAh battery. The phone runs on Android 8.0 Oreo upon release. 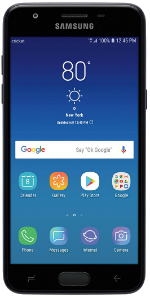 $200 off the Galaxy S9 Plus Was: 829.99 Now: $629.99 with order of service plan. Fios Gigabit Connection $79.99/mo+free router rental for 3 yrs. Plus 1 year of Netflix premium on us. No annual contract (auto pay rqd).